From digest to digest, we keep track of all Ecwid updates on the blog, so that you are always among the first to experience the latest e-commerce functionalities in your online store and stay on top of the game. 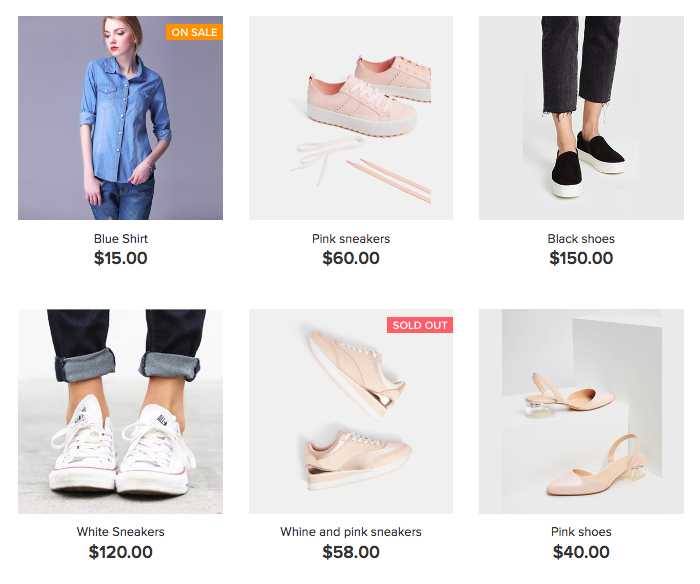 Set up the storefront grid to complement your products: add frames, darken background, show more product info on mouse hover, change image aspect ratio and size. Customize the way you display product info. Choose from different product page layouts, and much more. See all the design options in your Control Panel under Settings → Design. On that page, you’ll be able to try every change in a live preview, all without coding. If you can’t see the new settings, make sure you’ve enabled all the storefront updates in Settings → What’s New. If you’re using a self-made CSS theme or other custom-developed storefront features and are thinking of the best way to combine them with the new settings, our support team is there for you. Or get illustrated design tips in our blog post about this big release. New product labels (“On sale,” Sold out) apply automatically to products with set-up discount prices and to out-of-stock items. Your customers will easily find your best deals, and you don’t have to lift a finger. Do you have a small local shop or do you ship your products around six continents? In any case, Ecwid’s shipping options have got you covered. Select your shipping provider (USPS, FedEx, other carriers, or local delivery). Select how to calculate rates for this provider (automatic, flat, custom rates, or free shipping). Set up your rates if necessary. This update also makes setting up your shipping options more comfortable from any device and screen size. Try it in your Control Panel → Shipping and In-Store Pickup. The new Facebook Shop that displays your products on all sorts of devices (mobile, tablet, desktop). Various ad formats (including dynamic ads) using a single Product Catalog. Deep integration with the Facebook Pixel to retarget your store visitors on Facebook and build relevant lookalike audiences. Additional promotional tools, such as product tagging on photos you post. No custom development is needed — we’ve implemented the whole integration for you. Sync large product catalogs with Facebook up to 20 times faster. Just upload your products once, and every further synchronization will happen before you know it. For example, each repeated synchronization of 3,000 products used to take about 1,5 h — now it’s a matter of 5 minutes! 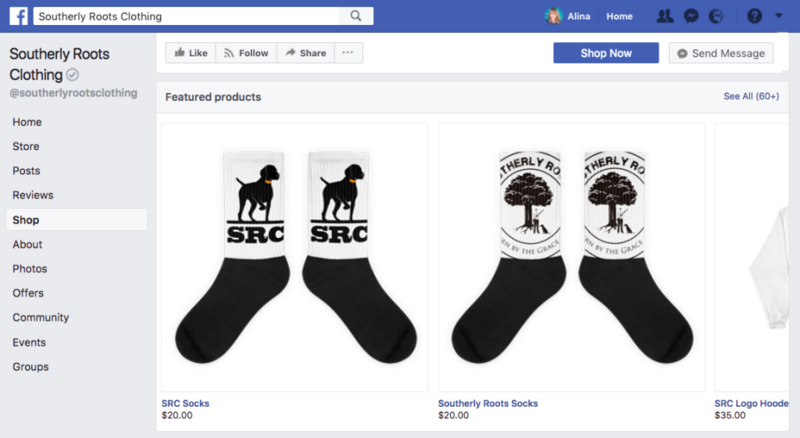 If a product has options or variations, they are seamlessly uploaded to Facebook so you don’t need to set them up once again. Connect your Ecwid store to Facebook to start growing your business now or read the full announcement to learn more about the benefits of the new integration. If you have an Ecwid account, it’s almost impossible to miss the Ecwid Starter Site feature, since it’s a forever free one-page e-commerce website available to every Ecwid merchant. But are you aware of all the recent improvements? Even if you sell on your own website (say, on WordPress, Wix, or Joomla) with Ecwid, Starter Site can work as your additional storefront without violating your website SEO. Find out how right below. First, now it’s possible to add custom code to the header of your Ecwid Site. Some services may require you to verify your website by copy-pasting a piece of code to its header. That is how you prove to be the owner of your website. For example, verification is required to advertise using Google AdWords or to access Pinterest analytics. With this update, your Ecwid Starter Site becomes compatible with many third-party services that can help you to grow your sales. You can also forbid search engines to index your Starter Site. This may be helpful if you add an Ecwid storefront to your website and also sell on Starter Site. By disabling Starter Site indexation, you avoid duplicate content and improve the SEO of your main website. Can’t see these settings? Make sure you’ve enabled the new Ecwid Starter Site in Settings → What’s New. There have been numerous changes to the Ecwid storefront in the last six months. The product page is where your customers decide to add an item to their cart, so you can’t overemphasize its importance for your sales. That’s why product pages in Ecwid have new customization options that you can apply instantly without changing your CSS theme. You have much more control over what you want to display on your product pages and how to lay out the information to convince customers to make a purchase. Set it up in Control Panel → Settings → Design: try different product page layouts (it’s dead easy) to find the one that converts best for your store. The shopping bag icon is a small but vital detail of your online store. It provides your customers with easy access to the cart from any store page. If you want more customers to finish their orders, it’s essential to make this icon visible, informative, and attractive. You can add the shopping bag icon to all or some of your website’s pages using an integration code (get it in Control Panel → Sales Channels → Custom Website). Customize your shopping bag icon to improve its visibility and make it compatible with your website design. Over ten new designs let you choose the look and feel, determine what info it shows (such as item counter or order subtotal value), define its position in the storefront (stick to the header or let it float on the page), and add or hide animated effects. See all the available customization options and learn how to apply them in our Help Center. The new icon widget is automatically enabled for Ecwid Starter Sites. If you sell on a WordPress website, you’ll find this icon in Appearance → Widgets. We’ll add this update to other Ecwid plugins too. 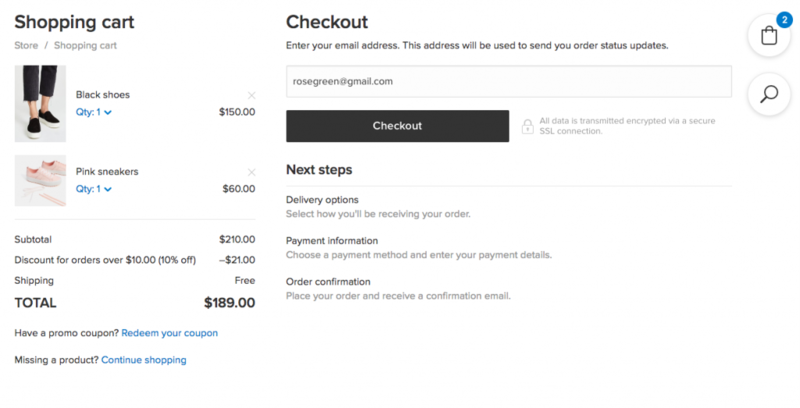 The cart page is the beginning of the checkout process. We’ve transformed it to maximize the use of this step. It’s now greatly optimized for smartphones and tablets — your mobile customers can shop on the go, which is a huge trend today. Collect customer emails right away. Now you can collect emails right on the cart page (rather than at the checkout), which means you can send a follow-up email to those who abandoned their orders at any checkout stage (= to a larger number of customers). Customize your cart page using CSS. We’ve moved the design of this page to CSS so that you can make more fundamental changes more easily. Enjoy the consistent and modern look of your online store. The new beautiful design of the cart page makes it match other store sections organically and improves the overall impression of your store. We’ve already started rolling out this new page to new Ecwid stores. Keep an eye on your Control Panel → Settings → What’s New: the feature will appear there soon and you’ll need to enable it. Similar to the cart page, we are working on improving the whole checkout process to make it faster, more customizable, and better optimized for mobile devices. Stay tuned! We’ve updated the design of Ecwid store settings in the Wix application to make it a native part of the Wix site editor. Add the Ecwid app to your Wix website to try the new consistent setup flow of your powerful e-commerce website without even noticing that you’re using a third-party service. As soon as you change something in the settings of your storefront appearance, you’ll see the site editor updating together with the store preview. Review the changes you make to the storefront on the fly. That’s just the first step of our updates to the Ecwid App for Wix. In the future, we’ll enable flexible tweaks of your storefront appearance in the same real-time mode. Use new customization options for your storefront. We’ve added a lot of new design settings that let you match Ecwid with your website and brand. Read our guide to using the new Ecwid design settings in your store. Add a new customizable shopping bag icon to your sidebar. The new widget looks better and has a number of customization options. Find it in Appearance → Widgets in your WordPress admin backend. Add a store to your webpage using the Gutenberg editor. This popular WordPress editor will soon become the default, so we’re working on making Ecwid compatible. Now you can add an online storefront to your page using a new Ecwid online store block in Gutenberg, or add a single product by clicking the Ecwid product button. Easily import your products from WooCommerce or a CSV file to Ecwid. Try a new separate Ecwid block under Tools → Import in the WordPress admin backend. Manage both your store and website as a whole. Ecwid’s store navigation menu has now blended in with your WordPress admin menu. It’s more convenient to manage your store, especially on mobile devices. Our mobile team is working hard on making Ecwid fully manageable from a mobile device. Besides the ability to design a one-page website using only your smartphone or tablet (and more store management features announced in the previous digest), now you can add, edit, and delete product variations using Ecwid Mobile for iOS and Android. Now you can also set up individual shipping rates for each product in your Ecwid store using just your Android smartphone or tablet. You are going to enjoy doing it, especially since we’ve improved the app interface and performance. Bambora Online Checkout: PCI-DSS secure online payments from all major payment cards in a wide selection of countries. CC Avenue: India’s largest payment gateway with 200+ payment options, including a PayTM Wallet integration. Instamojo payments: accept credit/debit cards, wallets, net banking, UPI & EMI in India. PayTM: another wallet for India. Paystack Payment Gateway: a payment option for Nigeria. Accept credit/debit card, bank account, USSD or mobile money from customers around the world. As a small business owner, you probably have a lot on your plate every day. You don’t have to do everything on your own. Some time-consuming tasks can be automated — such as tax calculation. New Zealand merchants can now use the Ecwid + Taxjar integration so they never have to spend hours on setting up tax rates and destination rules manually and so they can use this time in a more productive manner. Price Optimizer: A/B test prices in your Ecwid store. Doba: source over 2,000,000 products to drop-ship in your online store. Multi-Level Menu: add a beautiful and clear drop-down category menu with pictures to improve navigation. How did you find us? : ask customers how they found your store at checkout. Rare.io: increase your sales with personalized email campaigns. eFulfillment Service: outsource fulfillment from an award-winning third-party logistics (3PL) company. Dynamic Creative Ad Builder: create and optimize a Google Shopping feed and automatically build Shopping and Search campaigns. Exportfeed for Amazon: yet another way to sync your products to the Amazon Marketplace. Secure Traffic: control your website traffic and prevent fraud. DHL Express: ship your orders internationally and deliver locally with a world-famous provider. ShipIt: integrate with all major carriers under one integration and with competitive pricing. Get all store shipping options via Ecwid REST API in read-only mode. For example, you can use it to integrate a drop-shipping service with Ecwid. Generate a link that directs customers to a specific product variation in the storefront. This can be used for promoting certain products. However, these updates don’t even make up ¼ of all the spring API improvements. If you are a developer, let us know in the comments if you’d like to hear about more use cases of the Ecwid API. The Ecwid knowledge base has a new face, which should help you to get your questions answered. In case you haven’t found the information you need or simply have something to say, the comments section below is another place where you can meet the Ecwid team. Happy selling!